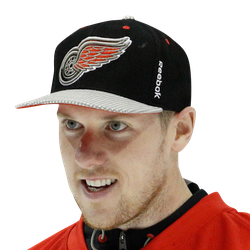 Jimmy Howard made 41 saves and Andreas Athanasiou scored twice as the Detroit Red Wings opened a five-game road trip by holding on for a 3-2 victory over the New York Rangers on Tuesday. Howard helped the Red Wings sweep the three-game season series with the Rangers by making at least 40 saves for the fifth time this season and 21st time in his career. Howard withstood New York's early barrage, making the first seven saves of the game, and then was particularly strong during the latter portions of the second period. With about 9 1/2 minutes left, Howard made a point-blank glove save on Pavel Buchnevich and then made a sprawling left glove save on a rising wrist shot from the high slot on Filip Chytil on a partial breakaway. Frans Nielsen scored in the first period and Athanasiou tallied in the second before adding an empty-net goal in the final minute as the Red Wings won consecutive games for the first time since Feb. 12-14 and recorded their fifth straight win over the Rangers -- each one by a 3-2 score. Athanasiou recorded his second straight two-goal game. He is two goals shy of 30 and has 11 tallies in his last 17 games. Ryan Strome scored a power-play goal for the Rangers, who are 2-for-33 on the man advantage in their last 11 games. Defenseman Brendan Smith scored with 10 seconds left after Athanasiou made it a two-goal game. 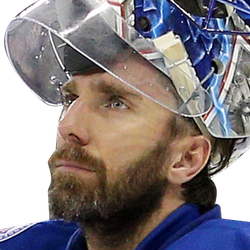 Henrik Lundqvist made 27 saves but missed a chance to become the sixth goaltender to get 450 career wins. He did set a milestone by joining Martin Brodeur and Tony Esposito as the third goaltender in NHL history to play 50,000 minutes with the same team. The Red Wings went ahead with 2:44 remaining in the first when Taro Hirose made a pass to Nielsen near the boards by center ice. Nielsen sped through the offensive zone, maneuvered past New York defenseman John Gilmour and ended a 13-game drought by lifting a wrist shot from the high slot past Lundqvist. Athanasiou made it 2-0 when he finished off a 2-on-1 with Jacob De La Rose 4 1/2 minutes into the second. De La Rose made a cross-ice pass over defenseman Kevin Shattenkirk's stick, Athanasiou breezed by Chytil and put a wrist shot over Lundqvist's stick. Moments after his attempt to tip a shot past Howard sailed wide, Strome ended the shutout bid by putting the rebound of a shot by Shattenkirk over Howard's left glove with 5:14 left in the game.